1) One of my biggest regrets is that I didn't become an actress. Theatre actress. 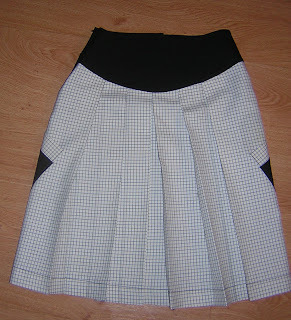 5) I am secretely pleased when my husband is away on business for a couple of days, because I can sew the entire time. OK, I might tag people who already got tagged, sorry for that. 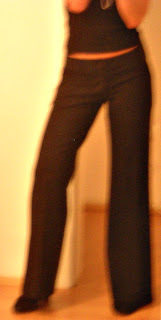 And now my fourth SWAP item, the Hot Patterns Slouchy Man Pants. God I love them and want them in every colour possible, they're the perfect office pants and very comfortable. They fit really well although for the next pair I might deepen the crotch a tiny bit (1 cm). I've decided to ditch the cuffs on the pants. Everybody says that cuffs on pants tend to shorten one visually. Although now I'm a bit sorry I didn't make the cuffs, I would have liked them as a detail plus the pants being black, I kind of doubt they would have shortened me. She will be quite angry with me for calling her kid sister. But I miss you so much, Schwesterlein, you mean so much to me. The first one on the left of the front row is a silky satin, the second is a cotton/lycra jersey, left on the second row jersey, the last one is a nice wool, probably perfect for my Simplicity 4047 jacket/cape. By the way, I think my Simplicity patterns have arrived. Now I have to wake up really early and cross the town to go to the postal office where I'm supposed to pick them up before going to the office. I'm not a morning person ouch! My mother says it's because I was born at night but who knows? I'm progressing both on my reversible blouse and on my Hot Patterns Slouchy Man Pants. It's amazing, the pants seem to fit perfectly, didn't have to alter them a bit so far. I'm really anxious to have them done, I love this kind of pants and don't own any. 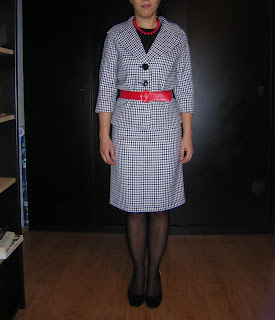 I managed to finish the houndstooth jacket and skirt and I am quite happy with them. 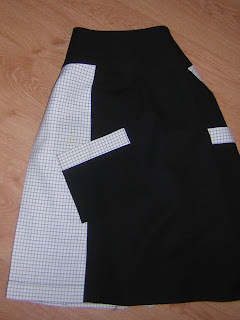 While sewing the jacket, I decided to add little round pockets. 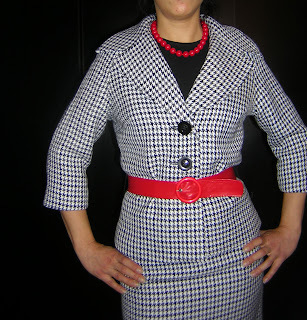 When I finished the jacket, I thought I would like it belted and did a self-fabric belt. No buckle, just a tie-on belt. After trying the belt on, I discovered it went a little over the superior part of the pockets and decided to ditch the pockets. Off they went. Then I've also decided I don't like the look of the self-fabric belt so much and thought that a red belt would be just the necessary colour accent for the jacket. So I bought a small piece of red false leather and a nice buckle and there it is. It is the third belt that I made. This false leather really was a pain! Even with my teflon foot and wash-away stabilizer, I kept getting skipped stitches. And when I undid the topstitching I ended up with lots of ugly holes in the false leather, of course! I finally solved the trouble by putting scotch tape on the belt and topstitching on it. But then the scotch tape, being quite a cheap one, was hell to take out. It was worth it however because I like the final result. Just click on any photo to see a larger version. 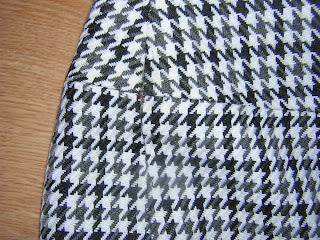 Close-up so you can see the fabric. Also, the belt is threaded through thread loops. Therefore when/if I decide to wear the jacket without the belt, the loops practically "disappear" into the fabric. 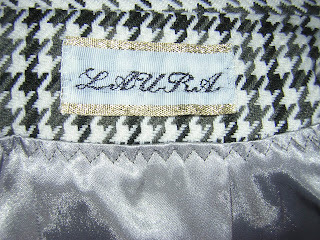 Close-up of label and silvery grey satin lining with decorative stitching. The Vogue 2859 blouse I have to redo. 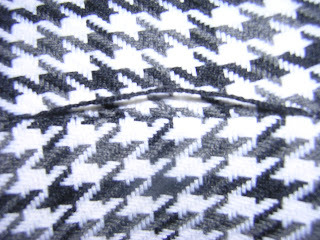 I don't like the fabric, well, I don't think it is suitable for this pattern. The pattern instructions advise for silk, satin or crepe. I used a fine cotton batiste which might be a little bit stiffer than satin. I bought a nice white satin and I will sew the blouse again. Think that the sleeve will drape a lot better in satin. What do you think? Changes that I will do to the pattern: I might lengthen it a bit (the present length does show a bit of skin at the waist). Also, I will ditch all the narrow hems (they drove my crazy, I have to buy a narrow hem foot), trim those allowances to 1/4, serge them and then hem. The blouse that you see here has French seams (I was out of white thread for my serger, also very curios to try French seams - never tried them before, and the fabric was appropriate, being a bit sheer). I don't think I will do French seams on the satin blouse however, the raglan shoulder on the back being a bit curvy of course, serging seam allowances might prove a better solution. And now the shirt I've done for my husband. 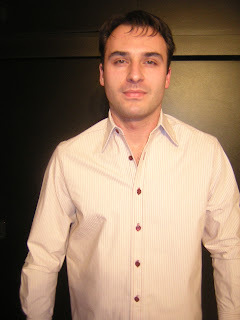 It's a nice beige quite stiff and a bit elastic cotton, with dark red stripes. 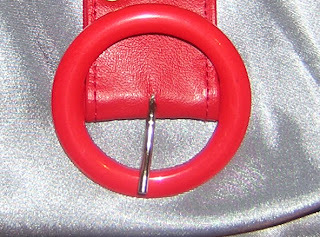 As you see, the buttons and the topstitching are dark red too. Florin seems to be very pleased with the shirt, he now wants another one. For this second shirt, I think I will use a denim blue cotton/linen. 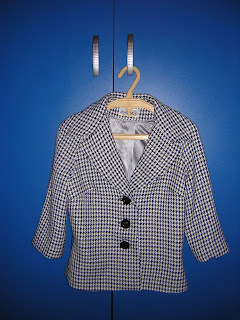 I will also make a mix between this pattern (copied after a RTW shirt that he loves) with a Burda shirt that is cut closer to the waist - both the front and the back are done in two pieces, a bit like a woman's jacket.